February 3, 2015 By Samuel Partida, Jr.
A police dog sniff of apartment door is going to require a warrant. It turns out there is no open invitation to the public that says they are free to bring their narcotics trained dog named “Hunter” to an apartment building to conduct a forensic investigation in the middle of the night in the hopes of discovering incriminating evidence. Darn. See People v. Burns, 2015 IL App (4th) 140006 (01/30/2015). The police brought their drug dog to Defendant’s apartment building so that the drug dog could sniff the Defendant's apartment door. The dog alerted to the presence of narcotics. The police and the dog left. When they came back to search the apartment they had a warrant. 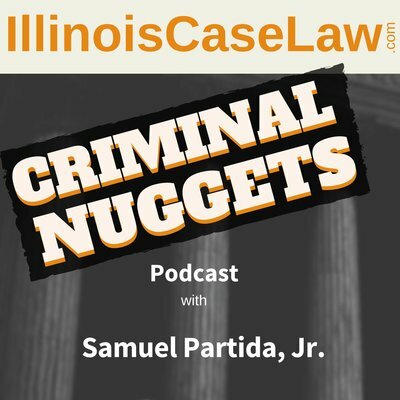 Defendant was charged with unlawful possession with intent to deliver more than 500 grams but not more than 2,000 grams of cannabis under the Illinois Cannabis Act, 720 ILCS 550/5(e). Did the police violate the Fourth Amendment by obtaining a warrantless sniff of Defendant’s front door? The relevant case is Florida v. Jardines, 133 S. Ct. 1409 (2013). I discuss this case in my “Police Dog Case Law Summary” article. You can find it HERE. Remember, this is the one where police brought a police dog to the front door of a single family home so the dog could get a sniff. The United States Supreme Court said that was unconstitutional. Defendant, in this case argued Jardines is not limited to those individuals who live in a single-family residence, because the opinion did not include this information. “Because Jardines protects against a warrantless dog sniff of a home's entrance, the use of a drug-detection dog to sniff defendant's apartment's door violated the fourth amendment.” ¶ 13. The State argued there is a distinction between a single family residence and a multi-unit dwelling. Residents in a multi-unit dwelling have a lower reasonable expectation of privacy because of an apartment building's layout and any person from that building or from outside of it would have the right to walk up to Defendant’s front door. I am on the record as saying that Jardines, was technically inconsistent with prior police dog precedent. So it is not surprising to see challenges to exactly how broad Jardines is going to be extended. Jardines came after Caballes told us drug dog sniffs are not a search. But Jardines got all touchy feely with a person’s home. So the home is special. “a simple baseline, one that for much of our history formed the exclusive basis for its protections: When ‘the Government obtains information by physically intruding' on persons, houses, papers, or effects, ‘a “search” within the original meaning of the Fourth Amendment' has ‘undoubtedly occurred.' ” Jardines, 569 U.S. at ___, 133 S. Ct. at 1414 (quoting United States v. Jones, 565 U.S. ___, ___ n.3, 132 S. Ct. 945, 950 n.3 (2012)). The front door and the area immediately outside the front door is also protected because of legal concept of curtilage. What the heck is curtilage? The constitution sees a home as not only the structure in which people live but also “the area ‘immediately surrounding and associated with the home,' ” an area referred to as the curtilage. Jardines, at 1414; quoting Oliver v. United States, 466 U.S. 170, 180 (1984). “This area around the home is ‘intimately linked to the home, both physically and psychologically,' and is where ‘privacy expectations are most heightened.' ” Id. at 1415; quoting California v. Ciraolo, 476 U.S. 207, 213 (1986). “The front porch is the classic exemplar of an area adjacent to the home and ‘to which the activity of home life extends.' ” Id. at 1415; quoting Oliver, 466 U.S. at 182. If we flush out the State’s argument a bit more, they are also relying on a line of case law that says that the police don’t have to deny themselves behaviour that normal citizens have the right to utilize. For example, any normal person has an implicit right to walk into an apartment building and knock on a front door, wait briefly to be received, and leave when they want. The Supreme Court simply said that although this may be true, the normal people who would do this don’t have trained police dogs that they are using to detect narcotics. Any implicit invitation a citizen has to knock on a front door does not extend to people who have police dogs with an objective to detect the presence of narcotics. There is no customary invitation for someone—including a police officer—to “march his bloodhound” up to someone's home to “engage in canine forensic investigation” and use a drug-detection dog “to explore the area around the home in hopes of discovering incriminating evidence.” Id. at 1416. Nor is there an implicit invitation for “a visitor [to] come to the front door in the middle of the night.” Id. at 1422. When it comes to a home the “reasonable expectation of privacy” arguments are out the window. In Jardines, the Court said that, “the home is first among equals” when it comes to the fourth amendment. Jardines, 133 S. Ct. at 1414. A home includes an apartment. “When the police stood at the entrance to defendant's apartment with a drug-detection dog, their investigation took place in a constitutionally protected area.” ¶ 45. “In this case, the police not only approached defendant's front door with a drug-detection dog to engage in an investigation of her home, they did so in the middle of the night. As Jardines makes clear, there is no implicit invitation for the police to do this and the officers in this case could not approach defendant's front door, absent a warrant, with a drug-detection dog to conduct a search of the contents her home.” ¶ 46.